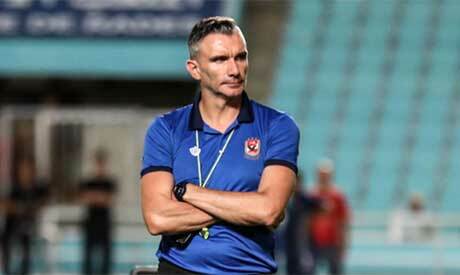 Ahly will face a difficult test when they face Algeria's ES Setif in the African Champions League on Tuesday, said the Reds head coach Patrice Carteron. However, Carteron explained that his team has big ambitions to achieve a good result in the continental tournament. "We are prepared for a strong confrontation against an opponent who managed to reach the semis after defeating the current title holders Wydad of Morocco," Carteron told Ahly's official website on Sunday. The Reds will host their Algerian counterparts in the first leg of the prestigious tournament semifinals. The return match will be played in Algeria on 23 October. "Our campaign has been a successful one up to this point, but we must focus on each match individually, and our full concentration now is on the Champion’s League after we’ve completed our match in the Arab Cup," the Ahly coach explained. "We’ve studied the Algerian team well. It is a good team with talented players and also an efficient coach, but we have big ambitions to win with a good score in Cairo to make our mission easier in the return match," he concluded. On Thursday, Ahly, who eye their first Champion’s League trophy since 2013, thrashed Lebanese side Nejmeh 4-1 in the second leg of the Arab Club Champions Cup Round of 32. Ahly ensured a place in round of 16 as the first leg ended with a 0-0 draw in Cairo on 13 August. Ahly currently lie seventh in the Egyptian League table with 11 points from five matches, six behind leaders and archrivals Zamalek, who have played three additional matches.